Governor of Lagos State, Mr. Akinwunmi Ambode has inaugurated the 2018 Armed Forces Remembrance Emblem at the Lagos House in Alausa, Ikeja. While inaugurating the Emblem, the governor said the event had continually served as a reminder of the gallantry and sacrifice of men and women of the Nigerian Armed Forces that had in no small measure contributed in protecting the nation’s cherished sovereignty. He said that it was important to remember them, especially for paying the supreme price of keeping the country safe and secure in challenging periods, and for achieving unity at the expense of loosing their lives. “It is time to engage ourselves in deep reflection of how such homes have been coping and how the widows and children left behind have been surviving, without important loved ones. It is time to rise in support by alleviating some of their needs, it is the time to express our love, extend appreciation and show gratitude to them for their services to our fatherland. “We must indeed show to each and every veteran that their service to Fatherland is appreciated, not just by the Nation, and the State, but also by ordinary individual citizens of this great nation. “It is important that we can continue live in unity and peace. 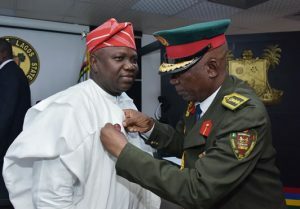 Accordingly, we must use this opportunity to convey symbolic messages to our serving Military men and women, that services and sacrifices to the Nation will always be rewarded and appreciated, to inspire them to be more patriotic and motivate them to give their all in the protection and security of our dear country,” Ambode said. While urging Nigerians to always treat ex-servicemen with respect and donate generously in the support of the Nigerian Legion, Ambode announced a donation of N25million as well as trailer load of rice for the families of fallen heroes.